I’ve written here before about my first forebears in the New World, how they came to the Chesapeake Bay in the 1600s. In that edition of Around the Campfire (#44) I wondered what they thought about the wealth—the Superabundance—of the New World: the mighty trees and seemingly endless big woods. I wrote then about how timbermen and settlers cleared that great forest. Here, I’d like to take a look at another resource the earliest comers to North America thought endless. To do that we must wander back to the world of my earliest American forebears—Tylers and Dodsons—and the rest of the seventeenth century settlers. If we walk these back paths, these seaside Atlantic paths dim and misty from more than three hundred and forty years’ time, we find thoughts and feelings about the land that are with us still, that overbear our land and wildlife wrangles today. Yes, beliefs that linger yet—notwithstanding how they should have fallen to naught but feather dust in the Killing Decades after the Civil War. Maybe the first take on the New World was amazement at the wealth of wood, fish, game, and farmland. The Western Europe from which the first explorers and later settlers sailed to the New World was an old world—overcrowded, overgrazed, overlogged, overfarmed, overfished; it was a land fearing a stark resource shortage with an energy crisis, a land whose carrying capacity had been overshot—a land and a civilization waning owing to land squandering and overpopulation. This is why the first tales back from the edge of the world were fat with the fullness of the new land and sea. Linger here for a little while. Read the above again. Put your feet up and head back. Then close your eyes and through your mind’s eye see what Josselyn saw in his eyes. The flight of the pigeon. Noonday dusk beneath their wings. What a mindboggling sight! What a fright when first you beheld it. Ahh, but what wild wealth when you saw the pigeons fly again! Aldo Leopold once wrote about how a landscape or any kind of wild neighborhood had its “numenon,” a living being that was the soul of that land. If the Great Eastern Forest thick with chestnut, oak, hickory, and other mast-bearing trees had a numenon or soul it was unquestionably Josselyn’s passenger pigeon. That storm of life gave being and definition to the big woods from Atlantic shores to the other side of the Father of Waters. 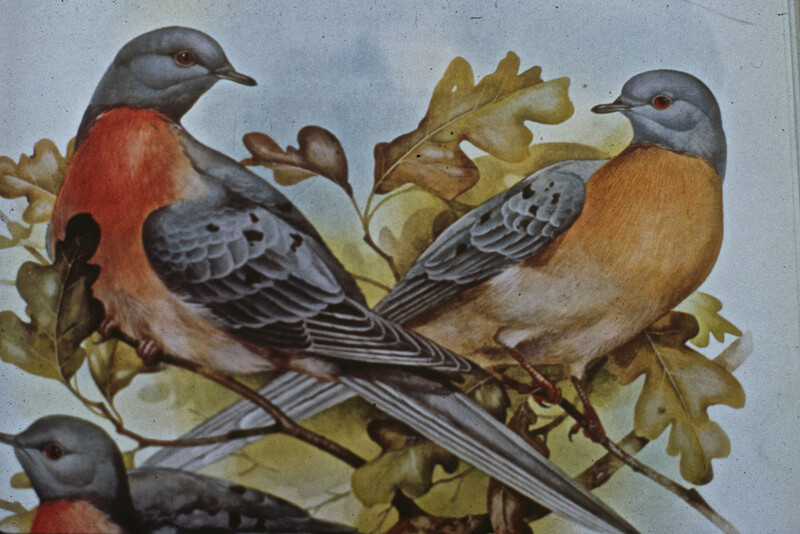 In other words, the passenger pigeon was the keystone of keystone species in the Mixed Mesophytic Forest (to call it by its ecological handle) of eastern temperate North America. It was its voice, its heart, its maker, and caretaker. Outfitted with the Myth of Superabundance and Puritan witch-hunter Cotton Mather’s wilderness-conquering theology, settlers scalped the land as they scalped the Indians. All too soon, the endless land-wealth began to run out. Poorly husbanded farms lost their high yield. Overhunting of deer was such that “in Massachusetts a closed season was enforced by 1696, and by 1718 a closed term of three full years became necessary.” Ducks and geese fared no better: “Massachusetts, in 1710, prohibited the use of boats, sailing canoes, and camouflaged canoes in the pursuit of waterfowl,” writes Peter Matthiessen. Never mind. There was more just over yonder. And the pigeons still flew. Westward ho! The lines of my family seemed to go through a farm about every generation and then moved on to richer soil, yet-uncut trees, and teeming wild meat. By the 1740s, the Dodsons had left the Virginia tidewater for the edge of settlement in southwestern Virginia. Before 1796, they were hacking away at virgin forest in middle Tennessee. My father’s family, Tylers, Foremans, and Shieldses, were trekking, too—first to the Shenandoah Valley and then following Daniel Boone over the Wilderness Road into Kentucky after the Revolutionary War. In 1808, my great-great-great grandfather William Frizzell settled in Belmont County, Ohio. Passenger pigeons darkened the skies above Frizzell, as they did the skies o’er my forebears south of the Ohio. 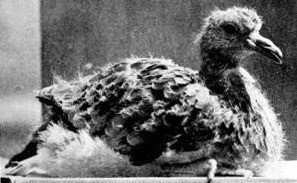 In 1810, early American ornithologist Alexander Wilson reckoned that a brawny flight of pigeons in Kentucky had 2,230,272,000 birds. That’s more than two billion birds. What Josselyn saw nearly 150 years earlier yet had not withered. Thirty years later, when my great-grandfather David Foreman was born in Kentucky, there was still no end to the meaty birds. I wonder if he hefted a gun in the great pigeon hunts when millions were killed on their nesting grounds, salted down for shipment to the cities, or left on the ground for the thousands of hogs herded in for the fattening binge. 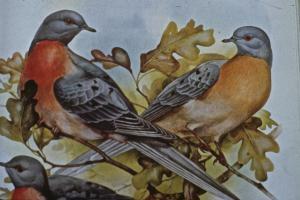 As late as 1857, the state of Ohio saw no grounds to slow the slaughter: “The passenger pigeon needs no protection. Wonderfully prolific, having the vast forests of the North as its breeding grounds, traveling hundreds of miles in search of food, it is here to-day and elsewhere to-morrow, and no ordinary destruction can lessen them or be missed from the myriads that are yearly produced.” Ahh, Superabundance! After the Civil War, though, landscalping blew up into a giddy free-for-all of bloodletting—The Killing Decades. In the twenty gory years following Appomattox, 30 to 50 million bison were shot . . . Please click here to read the entire original Campfire. There is some speculation that humans were responsible for the over abundance of the pigeons. Something happened after the European settling of the new world that caused a rapid population spurypt. This was decided after examination of kitchen middens of early native americans where no passenger pogeons bones exist in any numbers that seems unlikely that such an abundant food source was ignored. What do yo think?